Motion sensor lights require occasional maintenance when the bulbs burn out. Fixing the problem is simple, because all you need to do is replace motion bulbs with new light bulbs. Using a cloth between your skin and the light bulb is an important safety precaution to take when changing bulbs. Oils from your skin can linger on light bulbs, and if that oil gets too hot as the motion light bulbs burn, it can cause the bulb to shatter. If your motion sensor light is in a location you don't frequent, such as in an alley, make a note to check it occasionally and see if it's time to replace the bulbs to keep your motion detector working properly. Place a lint-free cloth between your skin and the light bulb, and gently rotate the bulb counter-clockwise. Keep rotating the bulb slowly until it comes loose from its socket. Dispose of the light bulb according to manufacturer instructions. Some bulbs can be thrown away in the garbage, but compact fluorescent lamps (CFLs) require recycling. Grip a new light bulb with the lint-free cloth. 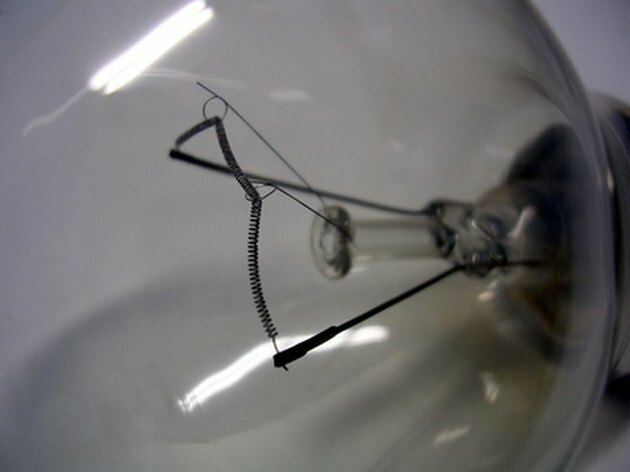 Slide the new light bulb into the socket, and rotate it clockwise until the bulb is tight in the socket.